• The System Seven™ MVP4000 series is suggested for anyone who experiences ball speeds around 100MPH. Chosen by more Major League professional athletes than any other brand, the MVP4000 masks are the safest and most durable catcher's masks available. • The MVP4000 features an I-BAR VISION™ steel cage, an extremely durable polycarbonate shell, breathable 3D mesh padding liner, a backplate designed to keep the snaps on, and an extra band of shock absorbing vinyl nitrile in the forehead. 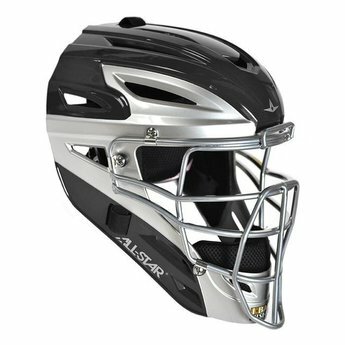 • The moisture wicking Armor Clad™ mesh liner system is removable and machine washable. Replacement padding can be purchased separately. Having a second liner system can be usefull for those hot summer days with double header games. • SIZES: The Average 12 year old can typically start wearing an Adult sized helmet. • CLEANING: Machine wash liner. Cold water / mild detergent / air dry.